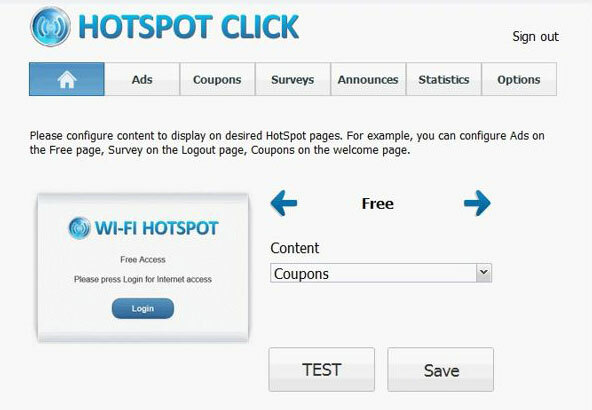 How to configure Coupons in HotSpot Click? 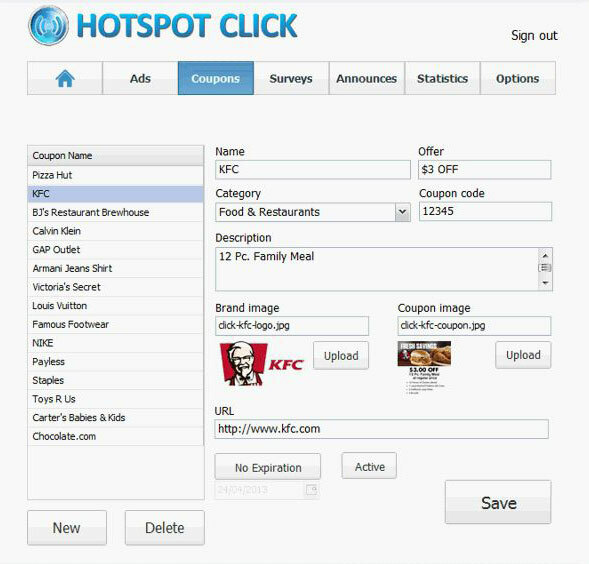 HotSpot Click allows you to display coupons within your HotSpot web pages. You can set the pages to show one or multiple coupons, allowing customers to get discount for services or products. Each coupon is displayed with the brand logo, coupon image, coupon code, optional expiration date, specific offer (like 20% off). After clicking the coupon, customer can see details about the offer, while software counts the number of clicks and provides coupon statistics. This feature is especially useful in malls or airports, you can help local businesses and franchises to attract more customers and monetize on each sale you bring. You will keep all the earnings made using HotSpot Click feature, they are not shared with Antamedia company. Pay only once for a lifetime license and use the feature without any limits. Before configuring coupons, you should activate Click engine, please go to HotSpot Setup – Advertising page and enable this feature, then click Save (licensed version) or Start Trial button. Application will start and your default browser will be launched automatically, so you can set up Click using intuitive web based interface. From the main screen select HotSpot web page you want to show the coupons, choose Coupons type from Content drop-down menu and click Save button. Repeat this procedure for other pages if want them to display coupons also. 2. Click New button located under the list of coupons. 3. Enter the coupon Name, so you can refer to it inside the Click application. After you configure your coupons, you can Delete default items you don’t need or stop them from showing by setting Disabled button. If you want to check how the page will look in customer’s browser, click on the home icon and press TEST button.